Innocence with a purr, or stealth curettage for the soul? On the off-chance that this document survives what now appears inevitable, I want you to know that it all occurred not out of malice, nor with any indifference to the slippery slope that begins with simple charity, but simply because we couldn’t resist feeding the little kitty. 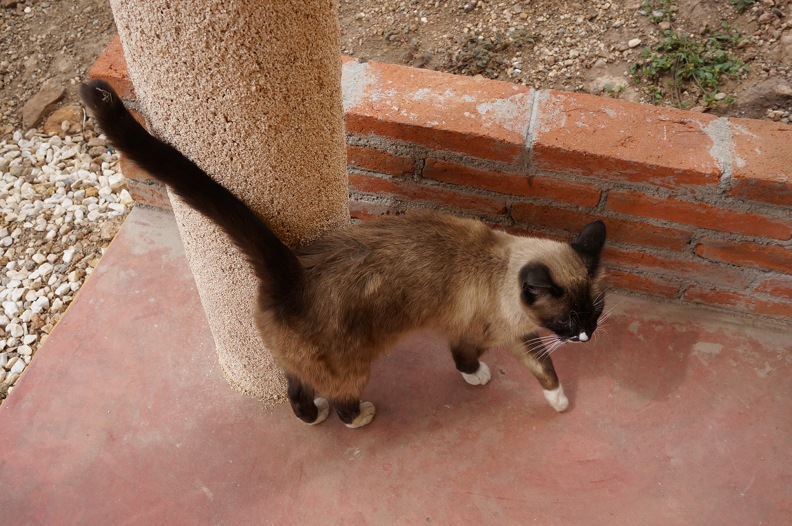 Anyway, my cats all died (not at my hand, I should note), and my wife and I found ourselves in a small house in the Mexican city of Oaxaca when the cutest little Siamese mix showed up on the porch one day. We were hanging laundry and heard him first. He had a bit of a weird white patch on his head, but otherwise looked pretty close to pure-bred. I later came to attribute the white patch to a parental contribution – I’m not sure which side would contribute “white head hair patch gene” – that, until that fateful act of copulation, had kept mainly to a knife-wielding clan of mountain lions. We called him “Gato,” figuring it would help us with our Spanish, and would be something both he and we could remember. I wasn’t sure if he was eating, and didn’t want to step onto that codependent handshake, but my wife (and the mother of our imminent heirs) gently suggested I give him some tortilla strips and scrambled egg scented with cinnamon and vanilla. “Just do it,” she said. I just did it. I put the food out on a piece of foil, and the cat nosed it a bit, turned and glared at me, then went back to the food. He licked it, bit it, gobbled it. Then he ate the foil. I’m not kidding. I didn’t see it, but when we came back from our daily walk, he was sitting on the porch, leaning against the wall, with what looked like electrical wire hanging from his mouth. I was curious. Wouldn’t you be? So I bent closer to look, and saw that it was more like tinsel. It was two days before Christmas, so I figured he was just getting in the spirit, and didn’t think much of it. I gathered up all the scraps, opened the door to the porch, and found myself staring at the cat. Same cat, same white spot on his head, but he was a little larger than when we first met him. Back then, he came to ankle height. Now he was staring at my knees, and drooling. I quickly dropped half the chicken skins onto a paper plate, and while the cat lunged at the food, I dropped the rest beyond the chain link fence so some of the local curs could share in the snack. While the cat was busy – as he ate, he emitted a sound that was a little bit purr, a little bit siren, and a little bit wood-chipper – I stepped back inside and bolted the door behind me. I could hear the cat through the door, and then he went silent. I looked outside, where he was descending into our yard through the barbed wire at the top of the chain link fence, a ragged hank of dog fur dangling from his lips. It looked like Yorkie or Bichon Frisee, but who can tell, at moments like that? I didn’t share my concern with my wife. I thought, he’s cute, and hungry. Cats will be cats, right? Later that night, I was woken by a sound outside our second-floor bedroom. I thought maybe it was one of the neighbors, trying to start their car, or get it up the nearly vertical incline of our dirt street. Nope. Outside, the cat was slowly grabbing pieces of scrap lumber in his jaws and maneuvering them so they leaned against the house. Just below the window to our bedroom. He was trying to get into the house. And, although it may have been the sleep in my eyes, or because I wasn’t wearing my glasses, but the cat seemed to have put on a few pounds. I’m not sure how many, but let’s just say he looked to have scaled up, by maybe a factor of, gosh, twenty? I could be wrong, of course, but the impression I got was that he didn’t really need the wood to get into our bedroom. A cat the size of the cat that now sat below our window, looking balefully our way, would be able to stretch upward enough to grasp the steel security cage cemented into the side of the house with its claws. And rip it out of the house. But it chose instead to climb slowly up the wood, until it reached the window, where it stared in at me with a somewhat accusing demeanor. “What’s going on?” my wife asked, sleepy in the bed, just below where I stared out the window. I went downstairs and came back with a bag of food for our little friend. I shoved it through the bars and he whipped it out of the air before it could fall to the ground. He turned and leaped to the ground, the bag in his mouth, a guttural growl expressing his appreciation. The sound that followed was the most hideous thing I have ever heard. Cold sweat erupted from my skin. I remember thinking, so that’s what it sounds like when you eat a plastic bag – full of chicken, chorizo, bread and papaya. I didn’t know cats even liked plastic, but we were in Mexico, and this cat was clearly a survivor. Living the feral lifestyle – what the locals call “la loca vida” – teaches a cat to broaden his dietary preferences to include items with a chemical profile a tad more complex than kibble. I didn’t sleep very well after that. When the sun came up, I looked out the window again. The cat lay in the shade against the back wall, sleeping off his gordito. But I have to be honest, my wife and I weren’t sure if we should leave the house to replenish our larder. She looked, then looked back at me. “He’s as big as a Volkswagen!” she said. We tiptoed through the gate and downhill toward the market. By the time we returned, however, the cat had awakened. We saw him as we approached the gate. He had been busy. The side of the house looked like a scratching post. All the electrical wires were down, like a huge hairball in the yard. I fumbled for the keys to open the lock on the gate. The cat stirred his now massive girth toward an upright posture. I got the lock open, and we scurried toward the door. The cat started slowly toward us. His head hung low, eyes intent on the bags in our hands. I slipped the key into the door and turned the lock. The cat quickened its pace. We dove through the entry and slammed the door behind us, throwing the bolt just as the door absorbed the impact of a huge weight, like a wrecking ball. The shock sent my wife stumbling across the room. I felt like my back had been dislocated, and that I would need disc surgery soon, or even a laminectomy, if my insurance covered it, and if I could afford the deductible. “You OK?” I said to my wife. She nodded, slowly picking herself up. As we both tried to catch our panicked breath, we stared at each other, in shock, really, except I was also wondering what brand of door could withstand that much brute force, and whether we could get one for our house at Home Depot. After a second, I went to the window, and pulled back the drapes. A huge eye, the size of a semi-elliptical glass-topped coffee table with a grossly dilated pupil, stared in at me. At the second I made eye contact with the cat, we heard it, like an oil-drill bit cracking basalt. It was oddly seductive, similar to a purr only different, as if a lynx larynx had been appropriated by a T-Rex, in its own primal way suggesting we should come outside and play, or at least scratch its chin, and while we were at it, drop off that freshly slain wildebeest that it thought we surely had lying somewhere inside this concrete cat box. What comes next? We’re waiting. If the cat doesn’t eat this document too, it is our hope that the foregoing account may give you some idea as to our whereabouts. Please don’t come looking for us. And whatever you do, don’t feed the cat.